In light of its commitment to continuously improve customer service, City Properties, as one of the leading property management company in the UAE has launched a series of advanced electronic services in cooperation with Emirates NBD and Network International. With these new services, customers can now process their renting procedures online, which will save them time, enhance company's service quality and provide convenience. City properties real estate provides many nuikue services including "postponement of cheques, payment against cheques, and booking of apartments, as well as viewing current and future payments" online. With this step, City Properties has become the first property management company to implement these advanced payment services in the country. 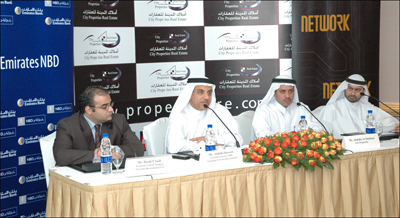 The announcement came at a press conference held today at the Grand Hyatt Hotel in Dubai. The advanced online services will link the City Properties' website to the online payment facilities that Emirates NBD and Network International have in place. The customer is provided with two payment options; one by using the e-debit payment mechanism, i.e. to pay directly from his bank account, and the second by using the credit card system. Customers who wish to pay from their credit cards, City Properties website will link them to the Payment Gateway; the online payment service powered by Network International, in which provides the convenience of paying the required amount from their credit cards . The Emirates Bank which is an affiliate of Emirates NBD Company introduced in 2002 the electronic debit service, "e- debite "which completes the e-commerce cycle. It is worth mentioning gate E-debitthe servicethat is provided by the Network International, is an online payment system which allows instant transfer of funds from Emirates NBD customer's account to the e-merchant account. The customer makes use of his bank Account to pay for his/her purchases.